GARY BALLANCE has been dropped by England and maybe he will feel there’s a bit of a weight off his shoulders now and he can come back to Yorkshire and enjoy his cricket again. He is an outstanding player and his record speaks for itself. He had a great start to his Test career and has just hit a little bump over the last three months since he came back from the West Indies. It can happen to any batsman. We will enjoy having Gary back around the dressing room and I am sure he will start contributing with us. The selectors have stuck with Adam Lyth and that’s good to see. In England, we do have knee-jerk reactions to losing games, but when you are opening the batting, you can get a few good balls and before you know it, you have gone a couple of Test matches without any runs. I am sure Adam is feeling the pressure a little bit, but he’s only one score away and it’s only three Tests since he got that big score against New Zealand. I’d love to see Lythy get another big score against the Aussies to give him confidence to enable him to kick on throughout the rest of the summer. Jonny Bairstow hit another big score this week and he has been outstanding throughout this season and I am really pleased with his England call-up for the third Test. From a selfish point of view, we’d have liked him around at Yorkshire for a few more weeks. 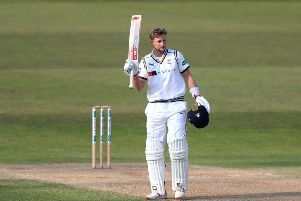 But having been told to go back to county cricket and get as many runs as he can and put some pressure on, that is exactly what he has done. If there was a time for England to pick him, it was now as he’s in the form of his life. It’s a really good time for Jonny to come back in and I am sure he will be really excited. Yes, there will be a few nerves in there, but you want to be given the opportunity when you are at the top of your game and he is at the minute. It’s been another fantastic week for Yorkshire. Worcestershire was a big game because they are down there fighting for their lives and then there’s our record at Scarborough. It was a game we felt we could definitely win and we were pleased to get over the line in the end. I thought Worcester were very workmanlike and resilient and made it hard for us. They showed a lot of ticker and fair play to them and you could tell they are scrapping for their lives at the bottom of the league. If they keep playing that sort of cricket, I am sure they will get a few results going their way. It would have been nice to have polished them off a bit earlier. But as long as you get the job done, that’s the main thing. We are now 34 points clear, although we are not getting too ahead of ourselves. But we are sat in a pretty good position now and with six games left, we have just got to keep playing the cricket we know we can play and keep up this good run of form. We need to respect it, but also respect the opposition because if you are not quite on your game in the first division, things can bite you. I was delighted with my century in the first innings. After the last few weeks with Twenty20, I had been feeling a bit mentally drained. But having a Friday night off from T20 and getting away for a few days from cricket ensured I came back refreshed and ready to go and with my mind on the job. To provide a big contribution in the first innings, I was really pleased with it. Yorkshire start in the Royal London One-Day Cup tomorrow and we had a really good run in this format last year and we want to continue that. We got to the quarter-finals last year and felt we could have got further; we should have got to the final really. We are excited about it, although we have been disappointed with our Twenty20 campaign, there’s no doubt about that. We have just got to move on from that. We are sat nicely at the top of the County Championship and the Royal London is another trophy that we want to win. We will sit down at Scarborough this afternoon and really put some plans together on how we want to play and address things. It will be difficult managing the bowlers with the schedule as we have got seven games in 11 days, which is going to be tough. But I still think we have the squad to compete. The third Ashes test starts next week and it is a really big one. It will be interesting to see what pitch they produce at Birmingham and there’s no doubt that England have got to come out of the blocks and show a bit more character than they did at Lord’s when they were totally outplayed and where they didn’t even compete.